Not everyone who was drawn to the Yukon in 1897 had dreams of striking it rich on a placer claim. There were also plenty of opportunists who went north to “mine the miners” by supplying the miners' need for supplies for the challenging trip north. From pick axes to prostitutes—everything could be had for a price on Alaska’s gold rush frontier. 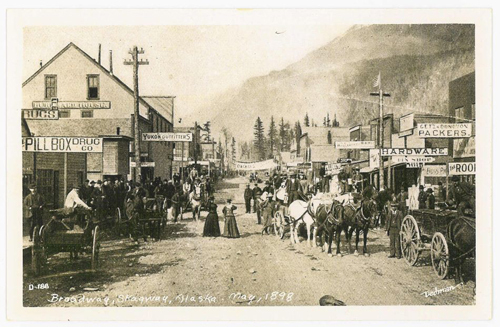 The town of Skagway, nestled at the base of the White Pass Trail, was among the wildest of these outposts; its population exploded almost overnight when gold was discovered along a Klondike River tributary just a year earlier in 1896. One of Skagway’s more respected entrepreneurs was a gentleman named Claude Arlington Pauley. He managed the Pacific Meat Market on Fifth Avenue during that wild gold rush summer of 1898. He had married a girl from Auburn named Matilda Elizabeth in 1892; they married in Pendleton, Oregon. Sometime after the marriage, the couple returned to Auburn where Claude mastered the butcher’s trade and where, in June of 1897, Matilda gave birth to a little girl whom they named Verda. It was probably the following spring when Mr. Pauley took his wife and daughter with him to Skagway, caught up in the excitement of the Alaska gold rush. After several years, Claude married another Auburn girl, Ella Pennington Gove, widow of Hiram Gove, in Vancouver, British Columbia. Together they raised her son John Gove, settling eventually in southern Oregon. Claude resumed the butcher trade, his adventurous Yukon years being well behind him. He died in Klamath Falls in 1959 and is buried with Ella in the Rest Haven Cemetery in Jackson County, Oregon. As for Matilda and baby Verda’s final resting place, it’s impossible to say for certain where they ended up. Auburn’s Mountain View Cemetery was open by the time of their deaths, but its surviving records go back only as far as 1907. If they are there, they are in an unmarked grave and do not appear in the cemetery’s records. It seems more likely, however, that they are at the Auburn Pioneer Cemetery. Again, there is no tombstone bearing their names, but there is a small notation on both of the earliest cemetery maps that could indicate their plot. “Mrs. Paley,” is all the notation says—no first name and no dates are included. The entry is just one letter off from our Mrs. Pauley’s name, and, while I cannot locate any trace of a “Paley” family in the Auburn area during this era, we certainly have documentation that Matilda and Verda Pauley were buried here in Auburn, forgotten casualties of the Alaska Gold Rush. 2Mrs. Pauley’s obituary was published in the Skagway News on June 14, 1898, and was reprinted in the Gold Rush Cemetery guidebook—see listing below. 5Sisemore, Linsy, ed. and Rachel Applegate Good, Historian. History of Klamath County, Oregon: its Resources and its People, Illustrated. Publisher unknown: 1942.